Google today introduced an update to Google Assistant that brings new behaviors and features to the voice-activated helper. First, the Assistant is rolling out a feature meant for families called Pretty Please. The idea, introduced at I/O in May, is to help parents and families respond to positive conversations with polite reinforcement. When children or other users say "please" or "thank you" when interacting with Google Assistant, it will respond in kind. Moreover, it is voice-matched so it will speak directly to the person by name. In addition to Pretty Please, Assistant is tacking on a handful of holiday-themed tools. For example, people can easily create notes and lists, such as "Hey Google, create a gift list." Assistant on smart displays will now play nicely with Nest video doorbells. It includes a two-way talk function so people can have a conversation with the caller. Google Play Music subscribers can take advantage of a new feature that brings song lyrics to smart display screens for sing-along fun. This is available for select songs. Assistant-supplied sound effects and music are available to more book titles for interactive read-along experiences. Children can say "Hey Google, call Santa" and have a chat with the annual gift giver. Google's Home Hub and Home speaker support replies to broadcasts. 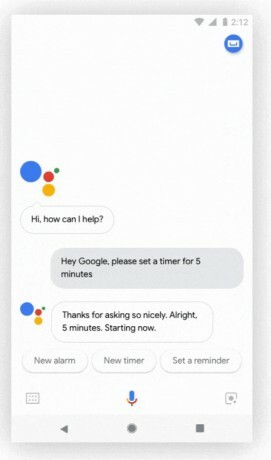 People can use Assistant from their phone to broadcast a message to the Assistant-powered devices at home, and receive a response from whoever is there. Last, Google has improved how Google Photos are shared on smart displays, making it easier to share photos with people on their contact list. These new features are rolling out today. Microsoft today introduced new tools for parents that can help them manage their kids' use of mobile devices. The Microsoft Launcher for Android phones now includes location history so parents can see their children's last known location with a time stamp.